I just finished with Evan’s valentines and thought I should share. 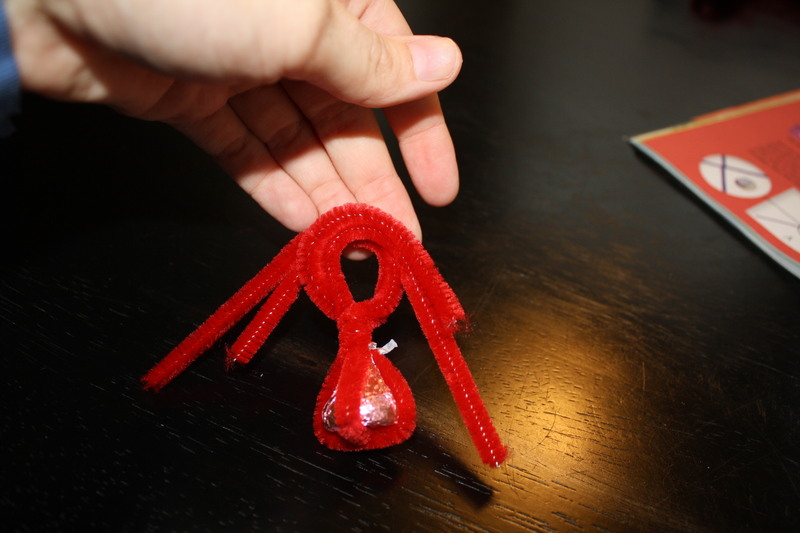 We made “Hershey Kiss” rings out of chenille stems. 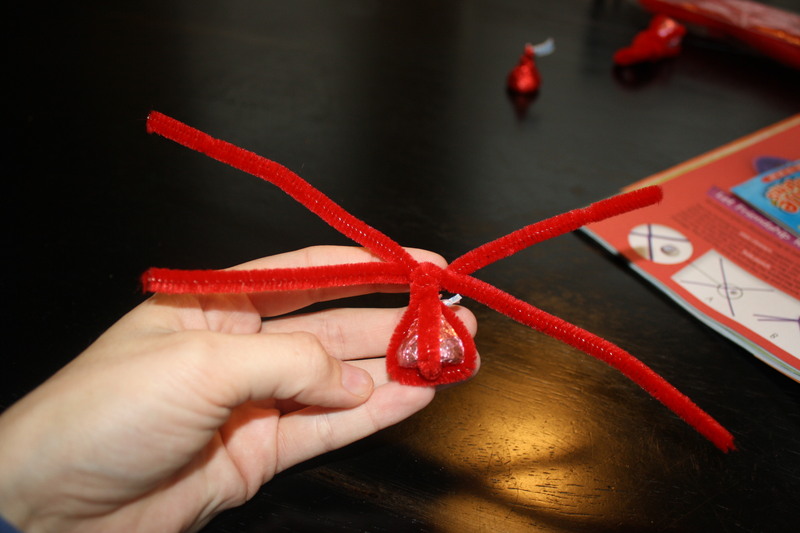 Each ring requires two chenille stems and one Hershey Kiss. 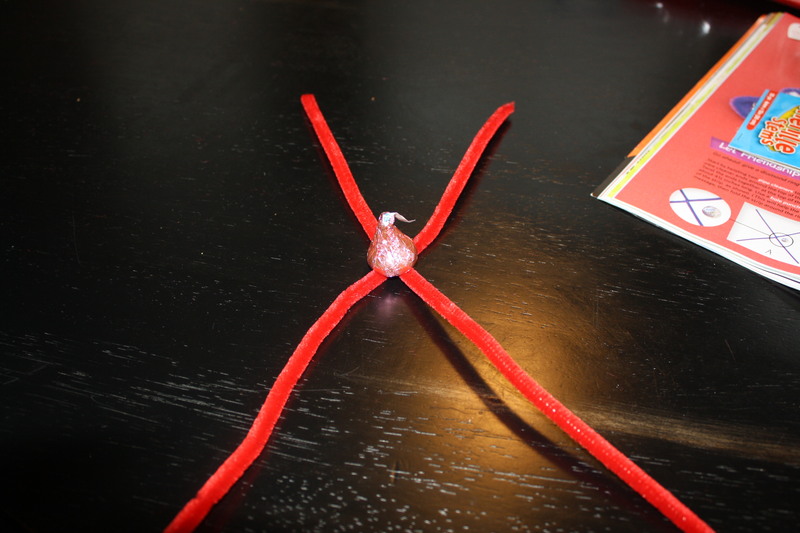 First, place the Kiss in the middle of two crossed chenille stems. Raise the stems up and around the Kiss. 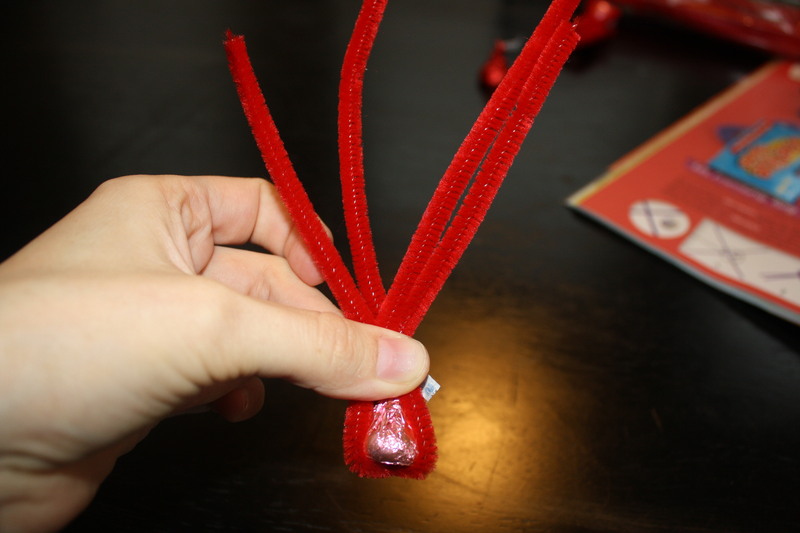 Now twist the stems around allowing the Kiss to remain in place. Once I completed my rings, I made tags using Cricut and attached with a bow. 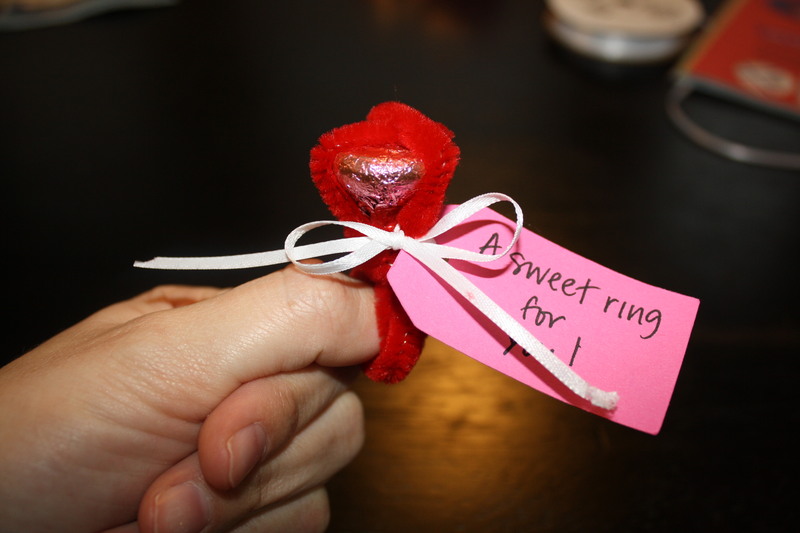 I used a total of three different sayings on the tags: “a sweet ring for you”, “you are a real gem”, and “a ring for a king”. I figured these were suitable for Evan’s Sunday School class, since their ages are only two and three. I’m sure the kiddies will pay absolutely no attention to my sweet messages on the tag, but I thought they looked more cute and completed when added. 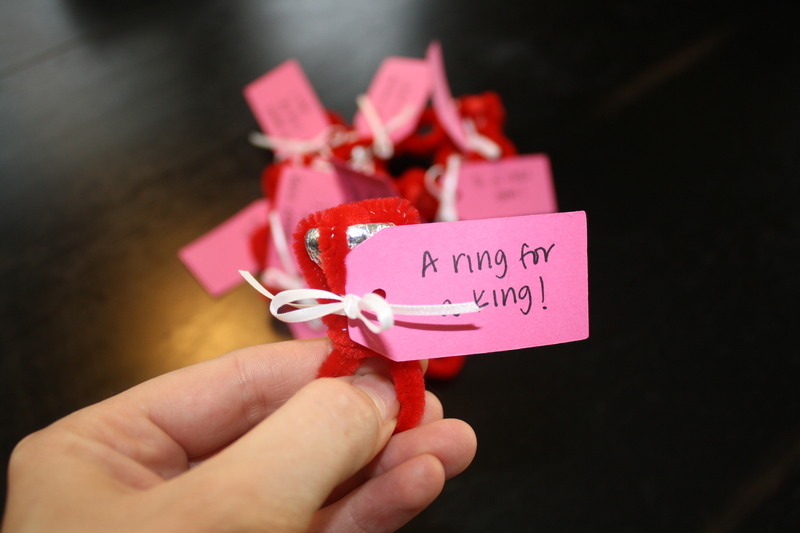 At first, I was a little worried that the rings might not be suitable for the boys in his class, but I quickly changed my mind when I saw how Evan seemed to love them. Honestly, I really don’t think it matters for his age group. All they are concerned about is the Kiss! On a different note, I’ve been in nesting mode. 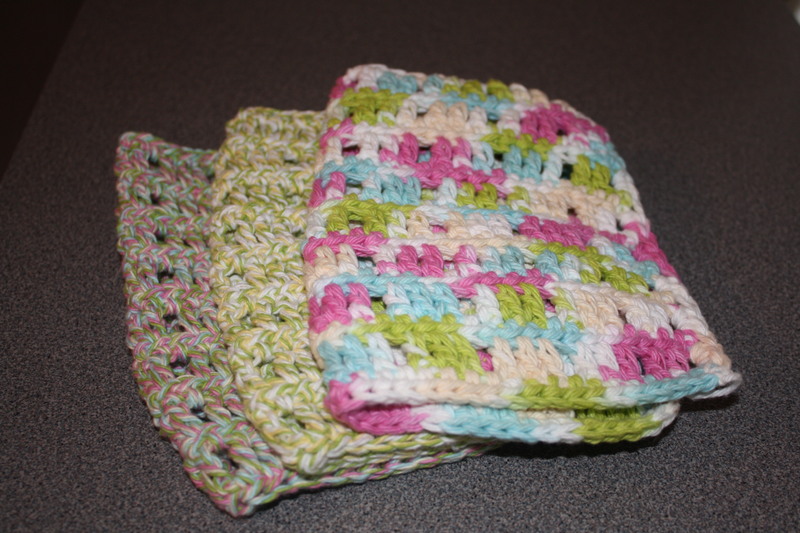 I’ve been crocheting like a crazy old hen and I’m currently fixated on making these dish rags. I love the bright spring colors and these rags make washing dishes a little more exciting! I decided to use the yarn brand “Sugar n’ Cream” for the rags. It is a higher quality yarn and is durable enough for getting the job done! And these make great gifts too! When reading the title of this post, please say it aloud like Joey Lawrence would during his infamous television days on the hit show “Blossom”. Hopefully, it will all make sense by the time you reach the end. Plus, I just want to hear you say it! 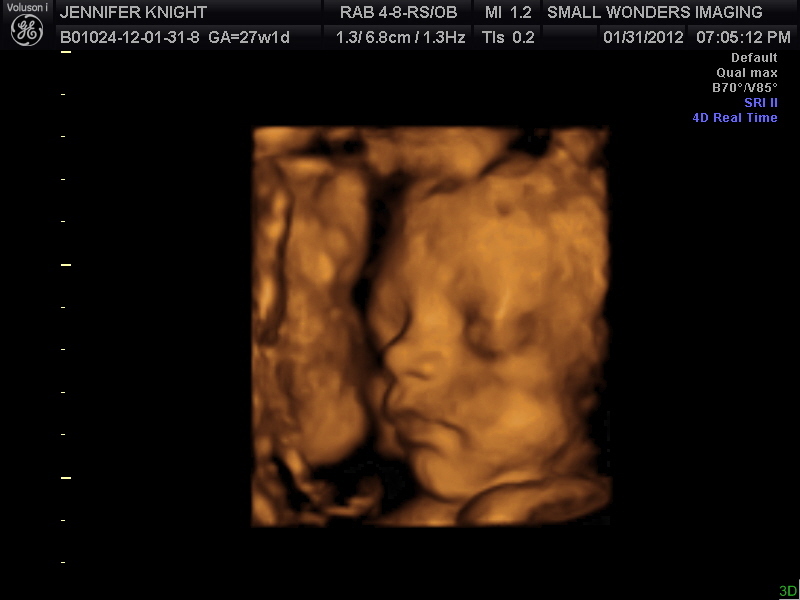 Last week, we were fortunate enough to schedule an appointment to see Baby Girl in 3-D again. She’s come a long way since we saw her last at 14 weeks! 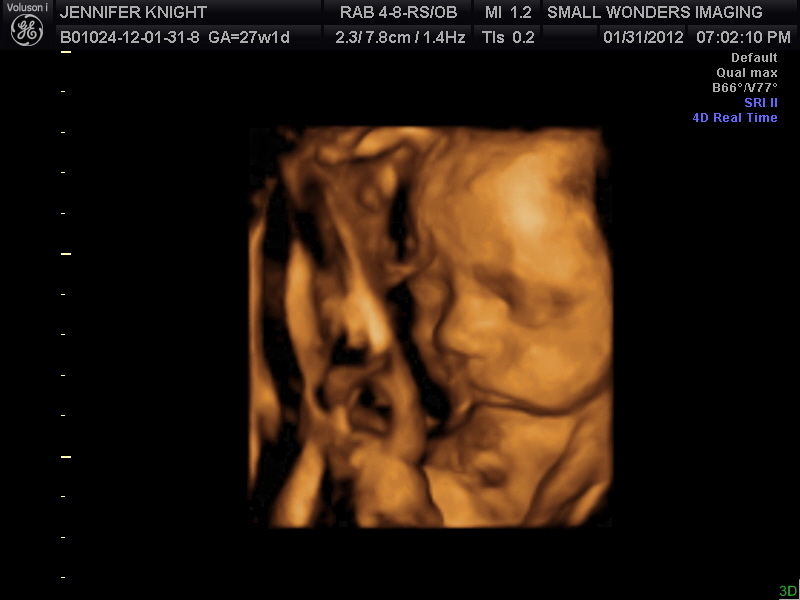 So below are some pictures of my beautiful baby girl! 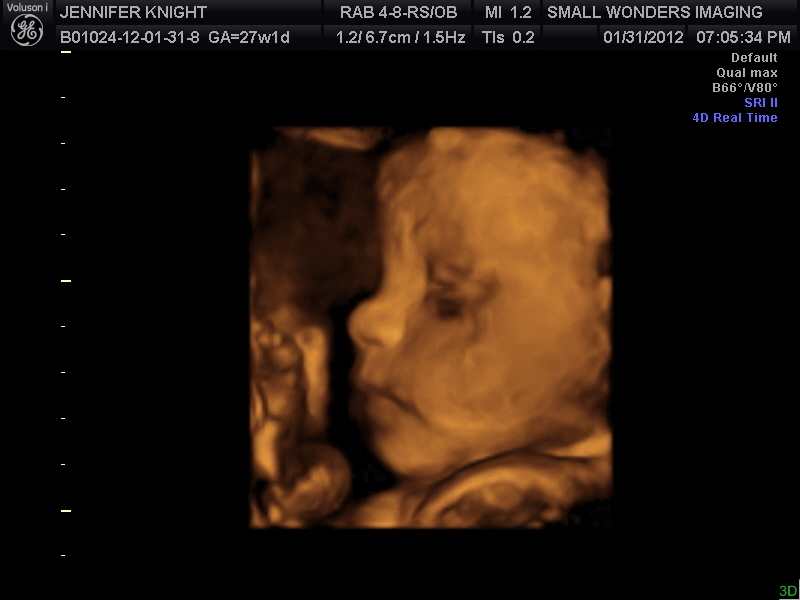 It’s crazy how much she resembles Evan when we saw him at 27 weeks. I’m fairly confident people will definitely be able to tell that they are siblings. She is even positioned the same way he was, “frank breach”. The last picture details it best. She is breach (head up) and folded in half (frank). Basically, her toes are touching her forehead. Also, there is no doubt that she is a Knight (not that I had any doubt who my baby daddy was). Those plump, chunky, round cheeks are all Knight related! We are currently in the process of redecorating the bedrooms. Evan is moving out of the crib and into the other bedroom where he will be sleeping in his BIG BOY bed. 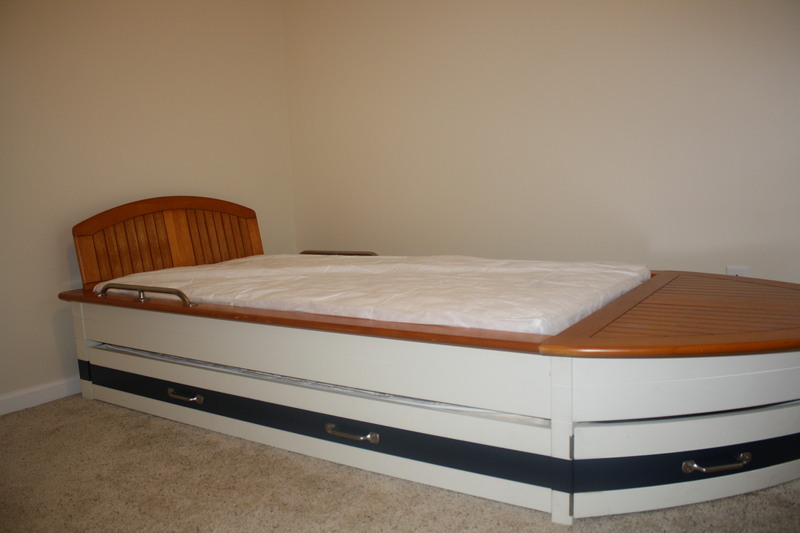 The boat bed is from Pottery Barn Kids and it was my little brother’s. It has recently become quite convenient having a little brother 21 years younger than you. The timing was perfect. 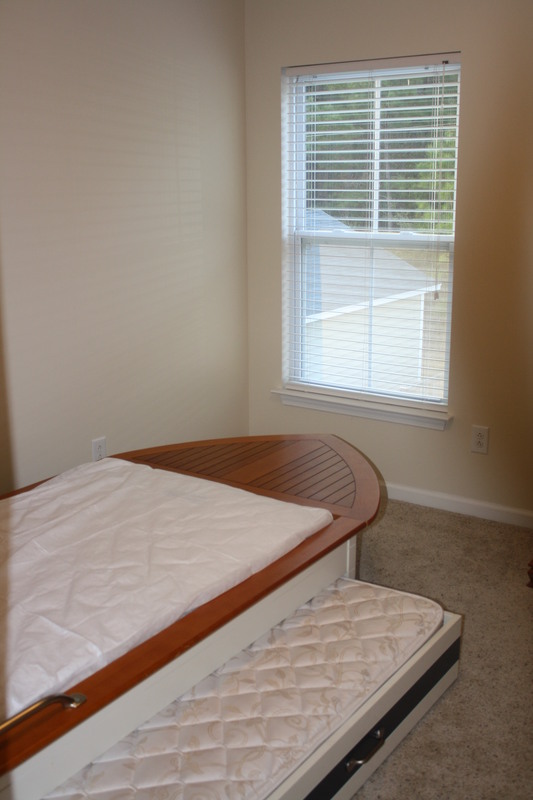 Seth is moving up to bunk beds, Evan is moving into the boat bed and baby girl will eventually be in the crib. I did manage to buy all his bedding but I don’t want to show it off yet. Monogramming must be completed first. Still on my agenda for his room is a trip the fabric store for window treatment. And lastly, we still have to paint his dresser. 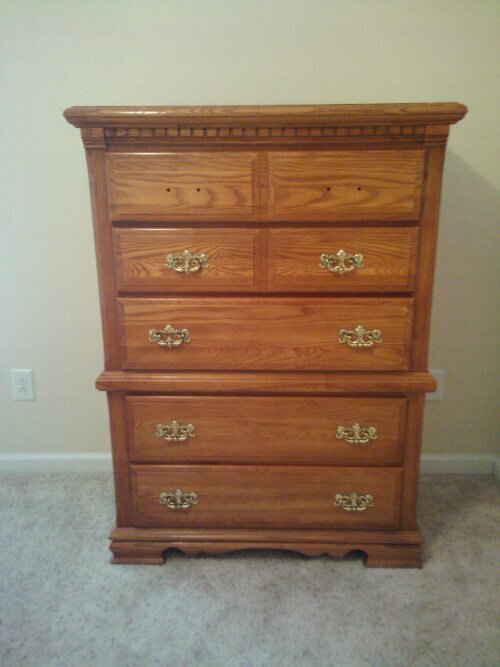 The dresser was mine when I was younger and with a good coat of paint and new handles, it should match perfectly in his room. During the midst of all my decorating, I wound up getting that vile stomach bug that everyone seems to have acquired. It was heinous. So bad, that I started having contractions! I will interject here that these said contractions did no harm to Baby Girl. 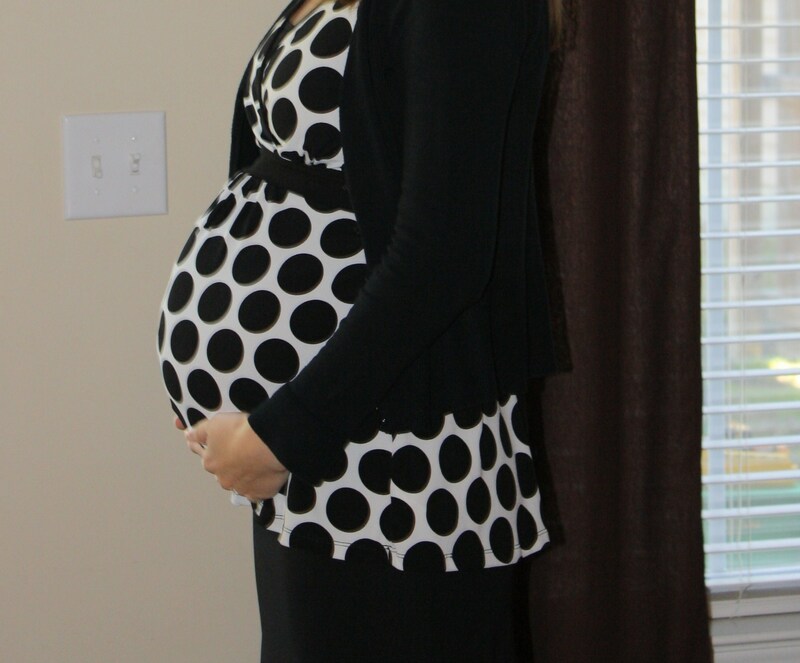 If you are unfamiliar with my first pregnancy, contractions are something new for me. 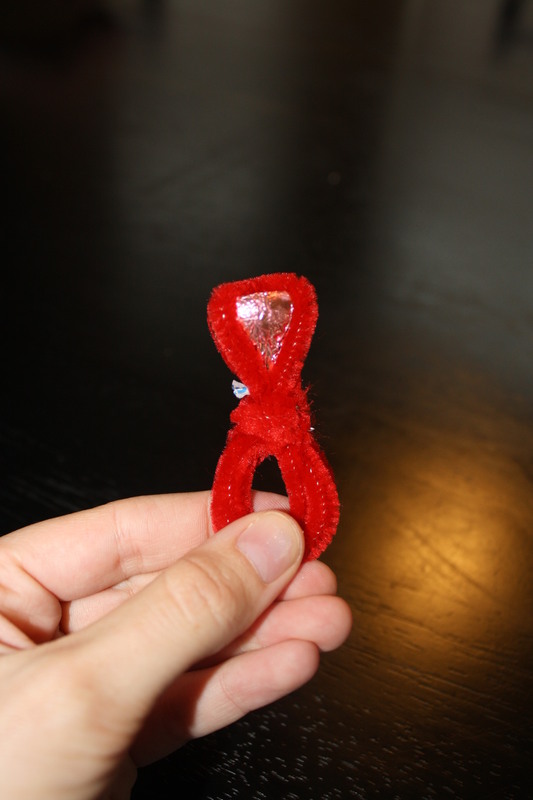 While pregnant with Evan, I went the whole time without experiencing a single one. Nor did I ever dilate. I’m telling you, that kid would have stayed inside me until his 15th birthday. During my projectile vomiting episode, I apparently popped some blood vessels in my eyes. My eyes are now blood-shot red and I currently look like I’m wired up on an illegal narcotic. I planned on being festive for St. Valentine’s Day, but blood-shot eyes were not quite the look I was going for. So this is what I’m looking like from the neck down! Just when I thought I was feeling somewhat better. I get a phone call. My go-go car (as Evan calls it) was involved in a collision on Super Bowl Sunday. 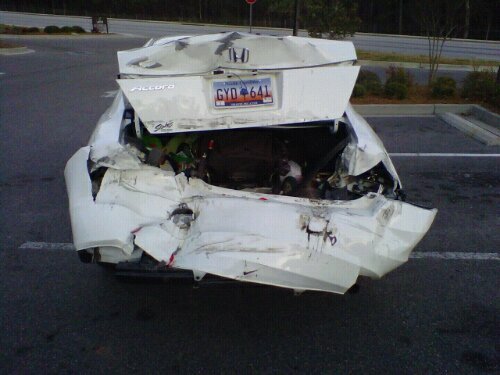 My dad was driving my car and was stopped at a red light when someone plowed into the back of him. The driver at fault did not even brake. He hit my dad causing him to be pushed into another vehicle. All I can remember is falling to my knees and thanking the Lord for my dad’s safety. I was also incredibly thankful that none of the boys were in the car. So now the search begins for a new vehicle. Evan already made his request and said he doesn’t want another white go-go car and that he now wants a pink go-go car. This kid! His favorite color right now is pink and everything must be pink! Everything! He will grow out of this, won’t he?